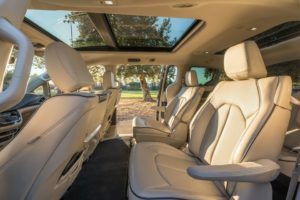 We’re going to examine 10 of the best new features of the hotly anticipated 2019 Chrysler Pacifica Hybrid; our bet is that they’ll be a best seller in car dealerships the length and breadth of the country not just in Surrey. These are now a standard feature and come on with the ignition and turn off when you turn the ignition off. This package actually made its debut last season and boasts Black Noise finish on the wheels, an all black interior, Gloss Black exterior accents and the “S” logo. Winters won’t be quite so unbearable with this feature which is available as standard on the Hybrid Touring L model and the regular model. When the sun gets low in Surrey you’ll be glad of this feature which now comes as standard; there are different levels of dimming and the great part is that the mirror does all of this automatically based on how bright the light is meaning you can just concentrate on enjoying the drive. These now fold out and in at the touch of a button; you can fold them in when you have a tight squeeze to get through or when you need to park on a busy street. Coming as standard the memory feature allows you to “remember” settings like seat positioning, mirror positions and even audio settings for multiple drivers. This great feature allows the drive rand front passenger seats to be moved at the touch of a button so there is more room in the second row for your passengers. You now get 17” polished wheels as standard with painted Tech Grey pockets to give a sportier effect. an eight inch touch screen. GO DODGE SURREY – One of the largest new and used car dealerships in Greater Vancouver. 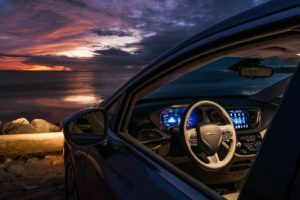 We’ve got a great selection of new 2018 and 2019 Dodge, Chrysler, Jeep, Ram and Fiat vehicles for sale! Looking for a used vehicle in Surrey? Our sales staff are both experienced and professional when it comes to finding you the perfect vehicle. No matter your preferences, they’ll find you a great vehicle! Surrey New & Used Car Dealership Location: 6280 120th Street, Surrey, BC V3X 1Y7.